We have mountains all around us, so of course we have Polaris snowmobiles for sale. Shively Hardware proudly carries the Polaris RMK®, The Rocky Mountain King. These sleds are built to take on the terrain you love to challenge. These Polaris snowmobiles are know for being the lightest, strongest and most flickable you'll find. And they guarantee enough power and snap to handle your moves in deep powder. You'll feel like the king of the mountain, whether you're a seasoned rider or a newbie. This sled is the ultimate mountain industry benchmark. It has added strength and durability while being light and rigid. Instant lift gets you right up to the top of the snow faster. That's because this sled weighs less, has a powerful engine, and features Polaris-exclusive track designs and a raised chassis. In addition, the seat is designed specifically for mountain snowmobiling. Thoughtful design means it was built shorter, so a rider can swing a leg, hopping easily from one side of the sled to the other. Whether off-trail or on-trail, the Polaris snowmobile ensures you'll have a more compliant and comfortable ride. You'll also notice the improved weight transfer when riding off-trail. The latest engine design offers an increased power-to-weight ratio, plus quicker throttle response for instantaneous lift. 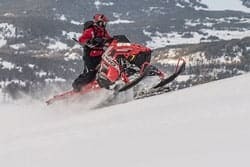 Meet the most advance instrumentation in snowmobiling! This sled comes with a hi- res, full color LCD digital display. Speedometer, tachometer, dual tripmeters, average speed and max speed displays, coolant temperature, diagnostics and maintenance warnings are all included. You'll even get details about riding conditions, like air temperature and time of day. And Bluetooth functionality means notifications of incoming calls and texts, and displays showing phone battery and signal strength. All you need to do is find the mountain trails you want to ride and get to it! Check out our current inventory, then come in and claim your Polaris snowmobile. It's time to hit the slopes! Here's a link to downloadable WY snowmobile and trail maps. Check on snow conditions, permit requirements and other snowmobile news here.